Do you remember mud pie? Not the mass of soil and water that you would serve in the backyard, at tea parties with butterflies and snails. But that special treat your mom would make, layering chocolate pudding and crushed Oreos, with vibrantly coloured gummy worms emerging from the chocolate brown substrate. This was a favourite at birthday parties, where each guest could have her own 'dirt cup'. At some point desserts became sophisticated and classy, mixing flavors and aromas only a more refined palate would appreciate. Yet deep down I think many of us long for the childhood pleasure that comes with dressing up a simple dessert as something it's not. 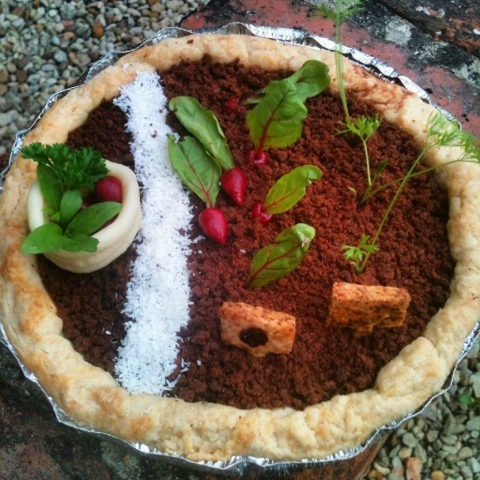 While a mud pie is a far cry from the dynamic soil ecosystem it attempts to mimic, it is a strange homage to the roles and support functions of organisms beneath the ground. Worms play a decomposition function, breaking down leaf matter and aerating the soil profile as they 'worm' their way through. Things like bacteria make essential nutrients available to plants - such as fixing nitrogen in the atmosphere into a usable form. Fungi can extend root structures to help plants mine the soil for what they need, permeating minute books and crannies. Now professing to be some semblance of an adult, I haven't ventured back quite to the point of the pleasures of yesteryear. However, in making a 'grown-up' (and vegan) version of the mud pie, I have somewhat intentionally brought together the vegetal and sweet (wc). Avocado and dark chocolate, both tropical agroforestry crops that require well-drained soil, form the base. Concentrated juice from boiled beet root creates an impressive burgundy colour in the marzipan beets. Another root crop that depends heavily on the composition of the soil, tiny carrots culled during thinning the allotment dot the cake crumb surface. 1. Purée avocado and sugar until no lumps remain. Old school smashing with a fork will also work, but the consistency will be coarser. 2. Melt chocolate and oil, either over a double broiler or in the microwave for 1 minute then 30 second intervals. 3. Pour chocolate into avocado purée and fold together with the vanilla. No green should be visible. 4. Fill the pie shell and then refrigerate at least overnight. Top with crumbs and any garden accoutrements you like. Worms (and spiders, etc.) are optional, but are a sign of a functioning agroecosystem! Enjoy with a dollop of coconut whipped cream in a verdant place. *brought to you from a train!